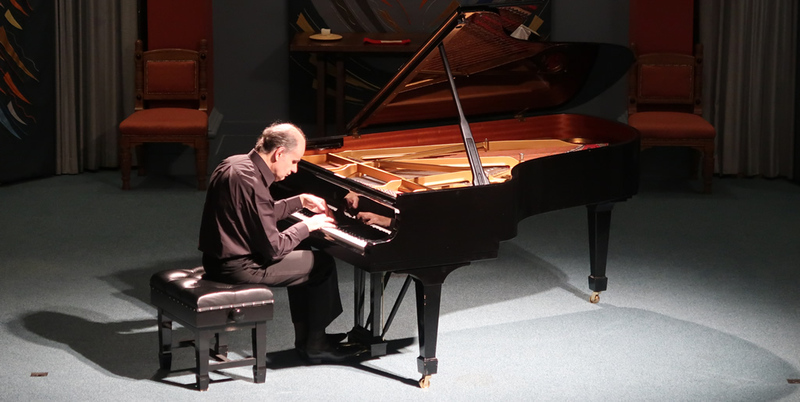 Since the acquisition of its Steinway grand piano in 1996, Penrith Music Club has enjoyed some outstanding piano recitals from artists around the world. 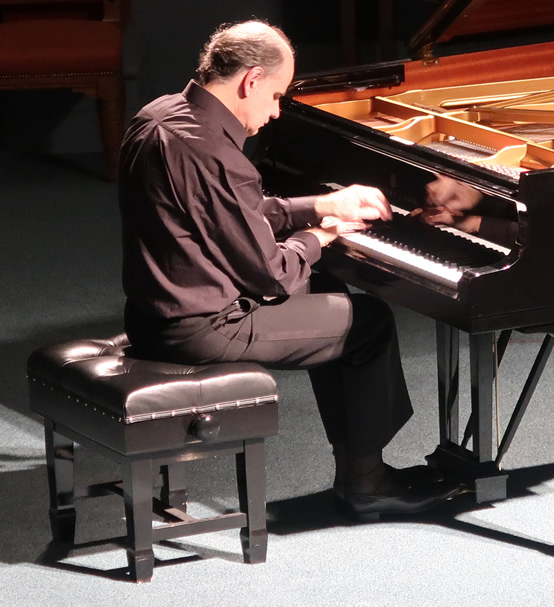 Bernard d’Ascoli’s recital in Penrith Methodist Church was one of the most remarkable of these. Born in Provence, and blind from the age of three, d’Ascoli first came to public attention when, at the age of 23, he gained Third Prize in the Leeds International Piano Competition. Since then he has gained an international reputation as one of the most accomplished players of his generation. Bernard d’Ascoli’s recital featured music with a French connection. Belgian by birth, César Franck spent most of his life in France and his Prélude, Choral et Fugue is one of his finest piano works. The three movements of this intensely-written work present a variety of moods, the main themes of which are cleverly moulded together as the work draws to its climax. Bernard d’Ascoli’s playing offered cascading arpeggio textures in the Prélude, a remarkable Choral with the left hand of the piano presenting the melody line above right- hand chords and a “walking” bass line, and a powerful and tense Fugue. The integrity of this tightly-constructed work was perfectly conveyed. Chopin was a great favourite of Parisian audiences in the 1830s when he wrote his two sets of Études. Although each étude stresses one particular aspect of piano technique, Chopin skilfully makes each piece into a convincing musical entity and the six études chosen on this occasion showed some of the great variety of challenges Chopin presents to the player. Beginning with the famous “Revolutionary Study” with its tempestuous demands on left-hand technique, and including the quirky “Wrong Note Study”, the sublime “Cello Study” and the incessant semi-quaver writing of the C sharp minor study, Bernard d’Ascoli created a comprehensive picture of the ingenuity and breadth of Chopin’s writing in a form he made very much his own. Debussy and Ravel were the two leading French composers in the decade before the First World War. Ravel’s Valses Nobles et Sentimentales are typical of the Impressionist sound world of French music of that time with constantly shifting moods – from alluring to acerbic, haunting to exotic, reflective to exuberant – with occasional touches glimpses of French café music of the period. Debussy’s Images, Book II also explore the characteristic sounds of Impressionism but in a more mystical way. Cloches à travers les feuilles creates an atmospheric, haunting picture of bells through the leaves while Et la lune descend sur le temple qui fut suggests the magical, mysterious sounds of a Buddhist temple. In contrast Poissons d’or conveys brilliantly the playfulness and flippancy of fishes at play. In this centenary year of his death it was entirely appropriate that Bernard d’Ascoli should end his recital with another Debussy piece, L’Isle Joyeuse. The enchantment of the isle seen in Watteau’s famous painting is presented in a piece of great excitement and ecstasy, which set the seal on a recital of great virtuosity and musicianship. Debussy’s sublime Clair de lune, played as an encore, supplied the final icing on the cake! Footnote. The more observant of our audience may have noticed that Bernard d’Ascoli played the same encore (Debussy’s Clair de lune) as the Scott Brothers Duo a month ago. The likelihood of that happening would seem to be pretty remote, except that it is, of course, the centenary of Debussy’s death. 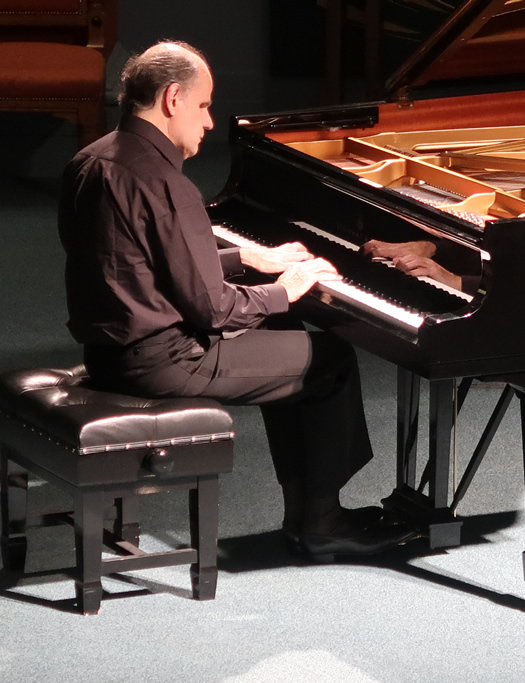 The two performances offered an interesting contrast – Debussy probably did not have in mind arranging Clair de lune for piano and harmonium but Jonathan Scott’s arrangement worked well!